Overall, Microsoft’s E3 conference made good on their promise – games, games and more games. Or was that last year’s promise? We forget. One thing is certain though. The Kinect is now but a memory, not mentioned a single time during the show. The humble Xbox 360 didn’t get a shout out either, save for the fact that Xbox One backward compatibility is coming later this year. 100 games are promised in the first update, followed by another batch at a later date. The Kinect’s death has seemingly paved way for the HoloLens – a piece of genuinely impressive tech that brings holograms to life. Minecraft and HoloLens would appear to be a match made in heaven, and one that’s going to help get HoloLens into living rooms all over the globe. Microsoft has also been busy tinkering with the Xbox One’s joypad. 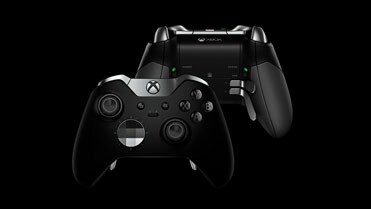 The result is the Xbox Elite Controller, with swappable analogue sticks, rear paddles, a new d-pad and other improvements. It’s a desirable piece of kit. As for games, it was a given that Halo 5: Guardians, Forza Motorsport 6, Fable Legends, Gigantic and Rise of the Tomb Raider would be shown. Which they were. Halo 5 impressed, offering 24-player battles. It’s due out 27th October. Rise of the Tomb Raider meanwhile is due 10th November – the same day as Fallout 4. Speaking of which, Fallout 4 on Xbox One will support PC mods and comes with a token to download Fallout 3. Forza Motorsport 6 has a release date too – 15th September. It wasn’t just a case of the same old faces and franchises. Far from it. Rare is working on their most ambitious title to date – a colourful online seafaring adventure known as Sea of Thieves. That joins retro collection Rare Replay, which we covered here. ReCore also came as a surprise, developed by Keiji Inafune and the makers of Metroid Prime. Well, two of the makers. Available next spring, it tells the story one of the last remaining humans. They aren’t entirely alone, however – the trailer sees them out scavenging with a robot dog, and after the events of an unfortunate surprise attack, a large mech. In addition to Fallout 4 a few other multi-format titles were shown. Specifically, FIFA 16, Dark Souls III, Madden NFL 16, Plants vs. Zombies Garden Warfare 2, Tom Clancy’s Rainbow Six Siege (out 13th Oct – will include Rainbow Six Vegas 1 & 2) and Tom Clancy’s The Division (now due March 2016). Plants vs. Zombies Garden Warfare 2 appears to have a deeper sci-fi streak, with purple neon lasers and UFOs whizzing all over the place. The trailer also featured a super-hero zombie. There’s no escaping that trend, is there? As usual, Microsoft’s ID@Xbox montage was a delight to behold. Cuphead, Ashen, Castle Crashers Remastered, Rise and Shine and dinosaur shooter Ark: Survival Evolved were undeniable highlights. Also of note: Happy Wars is getting a spin-off in the form of Happy Dungeons. The conference ended with a double-whammy of Gears of War. Gears of War Ultimate Edition is due out 25th August, offering new content and multiplayer and a resolution bump to 1080p. Shame we couldn’t have a GoW trilogy – even fans will agree that the original is the weakest in the series. At least Gears 4 – as it’s currently known – is shaping up nicely. The five minute (or thereabouts) gameplay clip saw two new characters – a male and female – tracking a creature through a forest shrouded in moonlight, before taking shelter in an abandoned fortress to escape from a sudden storm. The demo ended with a new enemy type – a rampaging four-legged beast with a spiked tail – being chainsawed in half. If you’re eager to try out Gears of War Ultimate Edition then you’re in luck – a beta is now underway. On a related note, EA Access is also available to all gold members this week. EA has announced that Titanfall has just been added, should you need even further persuasion.